Cutlery And Utility Organizer Just $20.95! Down From $45! You are here: Home / Great Deals / Amazon Deals / Cutlery And Utility Organizer Just $20.95! Down From $45! At Amazon, you can score this Cutlery And Utility Organizer for just $20.95 down from $44.95 PLUS FREE shipping with Amazon Prime or for orders $25 and above! 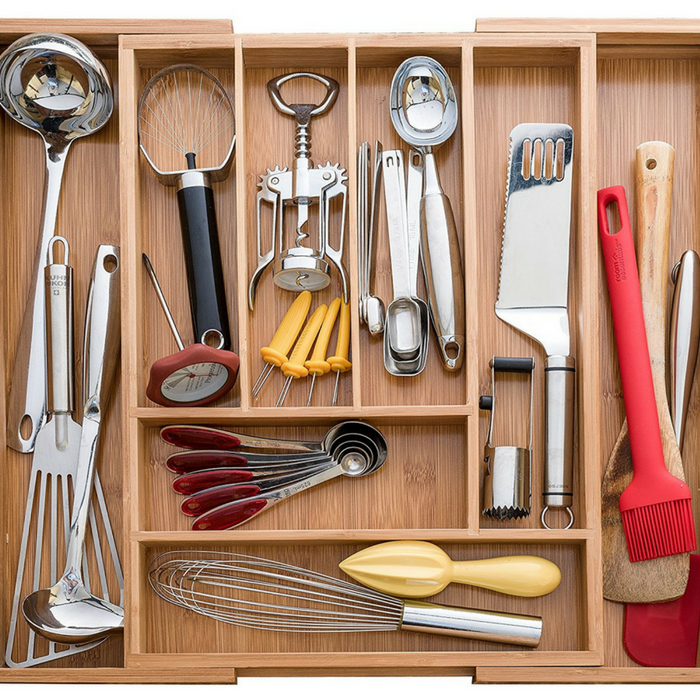 Keep your things clean and unstained for longer than plastic or metal organizers. Moso Natural Bamboo is beautifully uniform in color, and wipes clean. Expertly constructed to expand and collapse with ease, this Bellemain beauty is perfect to help you clean up your act—in the kitchen and beyond. NO MEASURING NEEDED | SPECIALLY CRAFTED TO FIT ANYWHERE: Generously proportioned through expert craftsmanship, our drawer insert expands from 6 compartments (12.75″) to 8 compartments (17.5″) to fit most drawers snugly, while providing an attractive, upscale custom look.